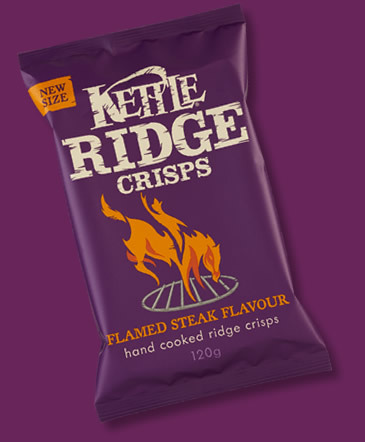 Kettle Chips certainly keep it simple with the regular range. Colour coded bags. Colours associated with the flavour. Minimalist design. Plain but fairly perfect. However, the Ridged range are all purple with the distinguishing feature a rather poor graphic image in the centre. They do stand out because purple is a rare colour in the Crisps and Chips world, but mostly because they are always stood with the other Kettle Chips on shelves. Most thick cut Crisps tend to soften fairly quickly simply because the extra thickness of the potato dictates this. However, these managed to remain crispy and snappy throughout the munch process. At the last knockings the Crisp turned to a gentle mush which made the substance feel more like eating food than a Crisp. These were fairly standard looked Rippled Crisps. The slices were thick enough to take the undulations, and those undulations were medium in depth and width. The colouring featured a light brown to darkish yellow. There were no oil boils to disrupt the surface of fairly sturdy looking machine cut Crisps. A Nose Plunge Test featured a slight stock sort of aroma, but not significant enough to consider for too long. The taste promised 'Flamed' and the bag design promoted barbecue grill sort of imagery. There was a particularly sweet undercurrent to a meaty sort of flavour, but it had no barbecue influence and while it was a meaty flavour it was not distinguishable as beef.